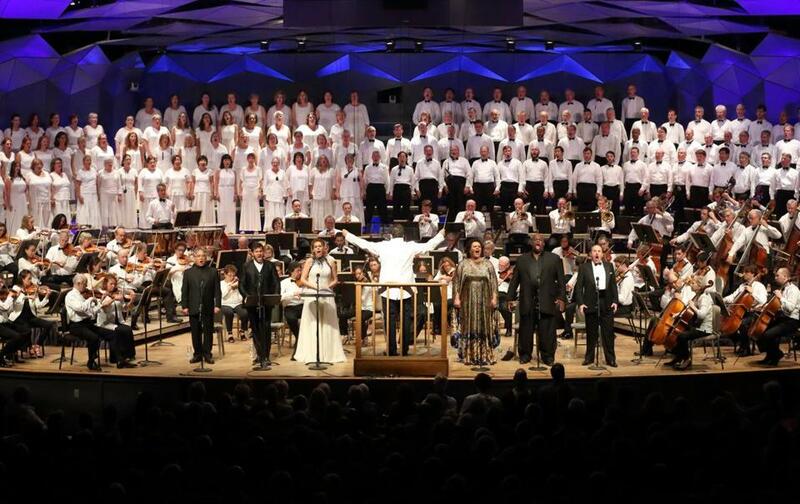 Music director Andris Nelsons guest vocalists and the Tanglewood Festival Chorus in the first two acts of Verdi’s “Aida” Saturday night at Tanglewood. LENOX — Ask someone who attended the Tanglewood performances of Berlioz’s “Les Troyens” or music from Wagner’s “Die Walküre” — to name two memorable occasions in the not-too-distant past — and they will tell you that few events quicken the collective pulse of this bucolic festival more than opera performed in concert by the Boston Symphony Orchestra. Saturday night once more underscored this fact, as Andris Nelsons led the orchestra, the Tanglewood Festival Chorus, and a strong cast of soloists in a galvanizing performance of the first two acts of Verdi’s “Aida.” Then Nelsons was back on Sunday to lead a second program consisting mostly of works inspired by Shakespeare. The famed triumphal scene of “Aida” may represent the epitome of grand opera for some fans, but from the outset of Saturday’s performance, Nelsons took care to also draw out the more subtle colors and intimately atmospheric details from this score. But this performance did not stint on grandeur when required, especially at the rousing conclusion of Act II, with large chorus at full cry, and antiphonal choirs of brass chiming in from opposite corners of the stage. Heading the cast in the title role was Nelsons’s wife, soprano Kristine Opolais. The two had performed the work together once before, at the Latvian National Opera in 2006, but Opolais has said she later realized that it was too early in her career for dramatic roles like this one. She put Aida aside, not returning to it for a decade, until Saturday night. On this occasion she used a score and understandably did not yet seem to inhabit the part as deeply as she does a signature role such as Cio-Cio-San. But her singing was instantly notable for its lustrous beauty of tone and for her ability to phrase lines in ways that projected the music’s pathos with a fierce directness. On Saturday night, the role of Amneris, Aida’s rival for the love of Radamès, was sung by the Lithuanian mezzo-soprano Violeta Urmana, with ample power and appealingly dusky colorings. Tenor Andrea Carè was an ardent if less distinctive Radamès. Morris Robinson was effortlessly commanding and stentorian as the King of Egypt, and Kwangchul Youn a resonant and compelling Ramfis. Franco Vassallo, as Amonasro, and Alfredo Nigro, as the messenger, capably filled out the cast, and Bethany Worrell, a TFC member, did the chorus proud in her solo turn. Overall the TFC, this time prepared by James Burton, sang with a nuance and confidence that lifted its work notably above the level of other recent outings. Perhaps in future summers, with operas that exceed the typical concert length, the work’s second half can be offered later in the same weekend, as was done with “Les Troyens” in 2008. Instead of Acts III and IV of “Aida,” however, Sunday’s program featured two souvenirs from this past season’s celebration of the 400th anniversary of the Bard’s death. Specifically, the BSO’s Robert Sheena reprised George Tsontakis’s “Sonnets,” a set of four darkly lyric tone poems for English horn and orchestra, inspired by the Sonnets Nos. 30, 12, 60, and 75, respectively. (The work was reviewed at its premiere in February.) As the “singer” of these texts, Sheena was again artful and poised. The Tsontakis was preceded by Berlioz’s Overture to “Béatrice et Bénédict” and followed by Saint-Saens’s Piano Concerto No. 5, a score not remotely Shakespearean but perhaps included here for its “Egyptian” middle movement that harkened back to the previous evening. The Croatian pianist Dejan Lazic dispatched this crowd-pleaser nimbly and with an almost elfin lightness of touch. Excerpts from Prokofiev’s “Romeo and Juliet” concluded the afternoon program, but publication deadlines necessitated an early departure for this reviewer. Violinist Robert Barnes, violist Kazuko Matsusaka, and assistant librarian John Perkel were also honored as this year’s retirees. The BSO’s season concludes next weekend with a program (Saturday) featuring Yo-Yo Ma, and with Nelsons stepping in for an indisposed Christoph von Dohnanyi to lead, for the first time, the ritual season-ending performance of Beethoven’s Ninth Symphony.